Finding the best bookshops in Edinburgh is at least a full day's job. This article is for all book-lovers heading to Edinburgh and wanting to explore some of the beautiful, unique and over-flowing bookstores in Edinburgh. Living in a non-English speaking country I find myself deprived of opportunities to browse books. And when I say browse, I mean hold, stroke, smell and compile lists of everything I want to read. A list almost as long as 'places I want to visit'. But on a recent trip to UK my inner book-worm was left thoroughly satisfied as I dragged my friends through every bookshop we walked past. Because I was about to leave for travelling, I showed incredible restraint and only purchased three books. Along with another two as I passed the bookshop in the airport and had a minor panic about it being my last chance to buy books! From hip bookshops of London to the treasure troves of charity shops in Manchester's suburbs, I visited more bookshops than eating establishments in my week-long trip. But by far the best was a day exploring the best bookshops in Edinburgh. So if you find yourself in this gorgeous city (and it should be on your list) here are the best places to browse, buy and love books of all kinds. This cute, little second-hand bookshop is next to the Meadows on the Newington side. It has a great selection of fiction, especially science fiction. The shop is quite small but worth a browse, books were around 3 pounds. There was also a selection of comics, non-fiction and collectors books. I always think you can judge a bookstore by its children's section. And this shop has a lovely one. Nestled in the back the shop with a beautiful selection of children's books and comfy cushions to sit and enjoy. They also do reading sessions for kids on weekends. There is a good selection of adult books too and they offer you free tea and coffee while you browse! You'll find Golden Hare in Stockbridge. This shop is was more for just soaking up some beautiful book vibes. They specialise in collectors items, antique and rare books as well as art. It's actually the oldest second-hand bookshop in Scotland and is really magical to wander around. It's located off the street, down some steps so is easily missed when wandering past. This may have been my favourite bookshop in Edinburgh in terms of aesthetics. It was definitely one of the biggest with all kinds of small rooms and nooks lined from floor to ceiling with books. There is a staircase hidden in the corner which leads to a cave-like underground section of non-fiction books. 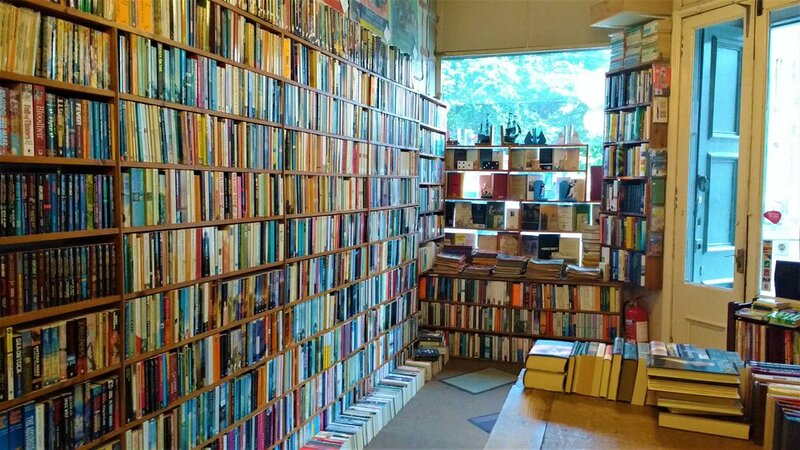 At this shop you'll find everything from popular fiction to rare books. A couple of doors down from Edinburgh Books, this place is smaller but has a great range. You need to spend some time searching but there is plenty to be found. The staff are friendly and helpful too. Just along the same street is this cosy, little bookshop. Sprawling shelves of books in every variety line the walls. There is something for everyone here and the prices are really reasonable. Lots of great fiction and some beautiful, antique books too. We went here at the end of our day but I could easily have spent a lot longer perusing the great selection! This is the ultimate way to top up your bookshelf. The charity shops in the UK have such a brilliant selection of books and they are usually no more than two pounds. And all the money you spend goes straight to charity! There are some organisations which have shops dedicated solely to books (Oxfam and Barnado's). The best places for charity shops in Edinburgh are Newington and Stockbridge where you can find 5-10 shops on the same street. A specialist shop of rare books, maps and art. Very small so not really for browsing but if you're looking for something rare or antique this is a good place to try. Know any other great bookshops in Edinburgh? Please share in the comments!